ST. GEORGE — The city has broken ground on Staten Island's first Family Justice Center. 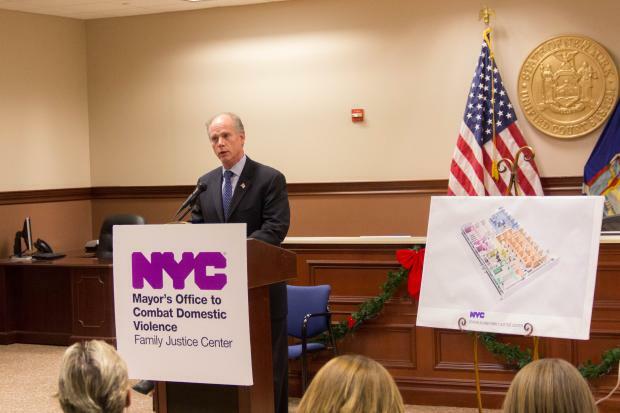 Yolanda Jimenez, commissioner of the Mayor's Office to Combat Domestic Violence, joined District Attorney Dan Donovan Thursday at 126 Stuyvesant Pl., where the center will be built, to announce the start of construction of the facility. "We used to re-victimize people by sending them all over the place," Donovan said. "[Now] everything's happening in one place." The site, which is planned to open at the end of 2014, will give a safe haven for victims of domestic violence who will be able to meet with a prosecutor, speak to a counselor and apply for financial and housing assistance all with one appointment. "This is the place that they can come," Jimenez said. "Regardless of where they live, regardless of their immigration status or the language that they speak, this is the place that will welcome them." The $3.1 million center should be open by the end of 2014, Jimenez said. Domestic violence has been a rising problem in Staten Island, with an all-time high of nearly 2,500 arrests last year. Donovan said the number's expected to be higher this year. "After the drug cases, the number one crime we have in Staten Island is domestic violence," he said. "And those are just the reported ones." Donovan has started several initiatives to help deal with the crimes — including ankle bracelets for defendants that warn authorities if they get too close to victims. "This is the crown jewel," Donovan said of the center. "This Family Justice Center's going to help so many women, so many children, so many families."